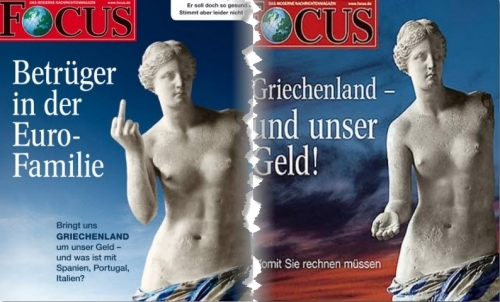 There’s only one word that adequately describes the majority of Dutch media reports on Greece right now: a witch hunt. Of all the arrogant stupidity, full of gut feelings of Dutch superiority, De Telegraaf takes the cake. ”Boom, kick them out of the eurozone. Our citizens no longer want to pay for these wasteful Greeks,” was this newspaper’s headline on May 19, following the results of a Telegraaf survey of over 11,000 participants. Or what about the following headline, on May 13th: “Again, billions of euros thrown into a bottomless pit.” Apparently this kind of nonsense works. By now, 58 percent of Dutch people are opposed to ‘giving’ even a penny to Greece. As long as the Greek economy kept growing at a remarkable 4-5 percent rate, thanks to the tourism and shipping industries (in which the Greek shipowners are considered the absolute world leaders), nothing could go wrong. The structural instability caused by excessive borrowing remained invisible until the crisis of 2008 did hit Europe, but left Greece untouched for the moment. The EU, under the presidency of France, decided to support the banks. Greece participated, although Greek banks did not use the support at the time. They did not need to, because — unlike Dutch banks — they had not participated in the “American casino games”. In that respect, the Greek banks were more solid enterprises than the Dutch ones. Their problem was — and still is — just that they (also) had Greek bonds in their portfolios. In 2009, the global shipping industry collapsed as a result of the global crisis. Tourism decreased dramatically. In the spring of 2009, European Commissioner Almunia warned repeatedly that things would go wrong for Greece. Nobody did anything. There were Greek elections in June and September. In such moments, it’s customary for Brussels not to bother a member state. Moreover, the right-wing prime minister at the time, Karamanlis, who was an ally of neoliberal Nothern Europe, felt that support measures could wait. In a solidary Europe, the question shouldn’t be: how do I get my money back with maximum profit? It should be: how do I help a country get out of a recession for which I am partly responsible, and who will foot the bill for that? In the first place, part of the money should be taken from those responsible for causing this mess — from the elite. The Greeks who have committed fraud for years on end, who evaded their taxes, who obfuscated their money and who speculated irresponsibly, are going free, partly thanks to a recent law on parliamentary immunity. It’s an eyesore to he Greek people that Papandreou has failed to sue even a single corrupt politician, to punish even a single entrepreneur or ship owner, and to recover even a single penny from the billions of euros that have disappeared into various pockets. And in no way does Brussels seem to be pushing for such measures. In fact, on this subject, Brussels has remained silent as the grave.